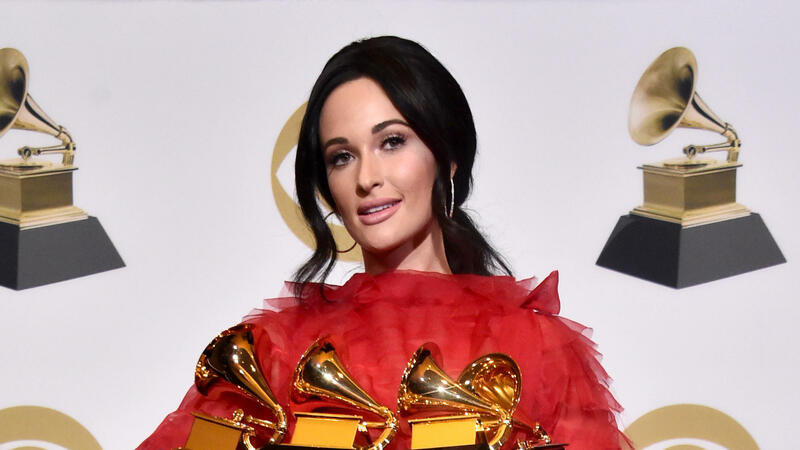 Kacey Musgraves holds the four Grammys she won Sunday night. 1) They spread the awards around, thank goodness. This wasn't one of those years where, say, Adele or Bruno Mars took home award after award, leaving fans of everyone else disappointed. Sure, Kacey Musgraves won four Grammys, two of which were announced on the telecast — those would be Album of the Year and Best Country Album — and Childish Gambino's "This Is America" overcame the Grammys' past aversion to hip-hop in the major categories, winning both Song and Record of the Year. But otherwise, the televised categories jumped around a bit, with awards handed off to Cardi B, Drake, Dua Lipa, H.E.R. and A Star Is Born so-stars Lady Gaga and Bradley Cooper. 2) Alicia Keys redefined the role of awards-show host. Keys, a 15-time Grammy winner, isn't a comedian and didn't try to be. But she is a gregarious and charming presence, as well as an outstanding singer and a beloved past collaborator of many people in the room. So she leaned into that, performing a medley of others' songs where last year's host, James Corden, would have filled time with a skit. 3) These Grammys worked hard to atone for past gaffes. Mainly the one where Recording Academy president and CEO Neil Portnow said, after last year produced a slate of mostly male winners, that women need to "step up" in order to compete in the music business. In addition to big awards for Musgraves, Gaga, H.E.R., Cardi B and Dua Lipa — who needled Portnow in her Best New Artist acceptance speech by saying, "I guess this year we really stepped up" — most of the night's memorable performances came from women. 4) The performances seemed especially strong this year. Musgraves performed the ballad "Rainbow" with muted grace to match her natural charisma, while Brandi Carlile (who won three awards early in the night but none during the telecast) positively crushed "The Joke." H.E.R. won loads of new fans with her performance of "Hard Place," Dua Lipa and St. Vincent were an unlikely but potent pair as they tackled each other's songs, Chloe x Halle served as a left-field knockout specializing in gorgeous vocal harmonies, Cardi B made "Money" an elaborately staged show-stopper, and Camila Cabello opened the night by presiding over an all-star cast of major players in Latinx music, including J Balvin and a mustachioed Ricky Martin. 5) An eternal GIF was born. Diana Ross wasn't up for any awards this evening — and has only one Grammy to her name, a Lifetime Achievement Award from 2012 — but she seized her spotlight with great relish. Introduced by her adorable 9-year-old grandson, Ross performed a medley of a few hits (opening with "Best Years of My Life") before standing atop a literal pedestal, red dress flowing, and exclaiming, "Happy birthday to meeeeeee!" Her 75th birthday isn't until March 26. Admit it: You're already planning to tweet that GIF the next time you're within 44 days of your own birthday. 6) An abridged guide to Grammy-related outrages, 2019 edition. Greta Van Fleet, a rock band renowned for its uncanny sonic similarities to Led Zeppelin, won Best Rock Album — a.k.a. One More Grammy Than Led Zeppelin Ever Received During Its Existence. Rapper 21 Savage, currently detained on immigration charges, was scheduled to perform until recently — and was never so much as mentioned until late in the telecast, when Childish Gambino collaborator Ludwig Göransson acknowledged him in an acceptance speech. A tribute to Motown was anchored by dance-pop star Jennifer Lopez, who was... a curious choice for such a responsibility. Ariana Grande was scheduled to perform until very recently, when a dispute with the Grammys' producers went public; she also tweeted (and then deleted) her displeasure when her former partner, the late Mac Miller, lost Best Rap Album to Cardi B. And finally, Drake — who'd also opted out of performing — accepted his Grammy for Best Rap Song (for "God's Plan") by minimizing the Grammys' importance; in a bit of not-good optics, his speech was unceremoniously cut short by producers. 7) Speaking of bad optics... Nearly three hours into a telecast that abruptly abridged speeches by several of its biggest winners, the Grammys still found time for a lengthy tribute to Portnow, who's stepping down this summer. Whatever his contributions to the Recording Academy and the music industry, no one has ever watched the Grammys for Neil Portnow, whose tribute at least felt as long as the one for Aretha Franklin. 9) It was a good night to have played the Tiny Desk. If you'll pardon the indulgence, a flood of Tiny Desk veterans won Grammys Sunday, including Kacey Musgraves, H.E.R., Brandi Carlile, St. Vincent, Daniel Caesar, Leon Bridges and PJ Morton (who tied each other for Best Traditional R&B Performance), Anderson .Paak, Cécile McLorin Salvant, Punch Brothers, Dave Chappelle, Terence Blanchard, "Weird Al" Yankovic, Kronos Quartet and the cast of The Band's Visit on Broadway. Inaugural Tiny Desk Contest winner Fantastic Negrito won his second Grammy and even thoughtfully shouted out the Tiny Desk in his acceptance speech. As rabbit holes go, you could do far worse than where this paragraph will lead you. 10) A thought for next year. Of all the Grammy controversies to persist from year to year, one of the least-discussed is the way nominees for the awards' biggest categories are chosen. Essentially, a panel convenes to trim a list of top vote-getters down to just eight (or, in the years prior to this one, five) nominees. But they don't pick the eight top vote-getters; they actually choose which nominees they'd like to see. Or, more to the point, they spike nominations that might make the Grammys look bad, or dumb, or out of touch. Last year, that meant that Ed Sheeran — a best-seller whose song "Shape of You" was one of the biggest hits in recent years — got shut out of all major categories, presumably to prevent him from repeatedly prevailing over Kendrick Lamar. (Instead, Bruno Mars did the honors.) This year, Ariana Grande and Taylor Swift were shut out of all the major categories, suggesting that the Recording Academy viewed the possibility of them winning as a potential embarrassment. In fact, in the Best Pop Vocal Album category — in which Grande defeated Swift, Camila Cabello, Kelly Clarkson, Shawn Mendes and Pink — none of the nominees broke through to claim one of what are now eight Album of the Year nominations. Which, finally, raises a question: What, exactly, are the Grammys afraid of here? Grande is an enormously acclaimed young star whose Sweetener was a hit with critics as well as fans; she's good enough, in fact, to have just won a Grammy for Best Pop Vocal Album. Swift, for her part, has been nominated for 32 Grammys and won 10. Whatever you might think of her album reputation, its exclusion from major Grammys categories stood out — especially when you consider that the Grammy committee had no qualms about nominating, say, Post Malone for Album and Record of the Year. At some point soon, the folks who run the Grammys are going to have to answer a few questions about what, exactly, is so embarrassing about pop music.